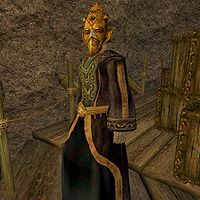 Galmis Dren is a Dunmer battlemage and the leader of a band of smugglers hiding in the cave of Nammu. He wears the Ring of the Wind, a powerful artifact which is being sought by the Imperial Cult. This page was last modified on 8 July 2013, at 03:22.